Sture Allén, born 31 December 1928 in Göteborg. Linguist, Emeritus Professor at Göteborg University. He was elected to the Swedish Academy on 2 October 1980 and admitted on 20 September 1980, the year after receiving the Academy’s Prize for Language Preservation. Other important prizes were the Chester Carlson Research Prize, 1988 (Royal Swedish Academy of Engineering Sciences) and the Margit Påhlson Prize, 2000 (Swedish Academy). Allén succeeded his philologist colleague Carl Ivar Ståhle to Chair number 3. 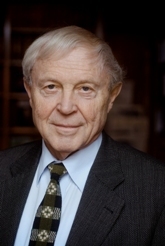 He was Permanent Secretary of the Swedish Academy from 1986 to 1999. Allén’s first prominent appearance as a linguist took place while he was studying at the Department of Nordic Languages in Göteborg. In 1958 he published an essay in Arkiv för nordisk filologi (‘Archives of Nordic philology’), no 73 on “Indelningen av nusvenskans pronomen” (‘The division of contemporary Swedish pronouns’), in which he presented a semantic categorisation of the elusive word class pronouns. He continued his research for some years at the beginning of the 1960s, when he was also one of Sweden’s first humanists to undergo proper computer training (at the ADP department of Chalmer’s College of Technology). On 31 March 1964 he published a farsighted article in the daily Göteborgs Handels- och Sjöfarts-Tidning, now closed down, on “Ordforskaren och datamaskinen” (‘The lexicologist and the computer’), claiming that “the introduction of computers as an aid in lexicology involves a revolution of the same order of magnitude as did that achieved by the exploitation of the art of book printing”. Published the following year, his doctoral thesis has elements of data processing. In Grafematisk analys som grundval för textedering (1965; ‘Graphemic analysis as a basis for text editing’) the smallest meaning-bearing units in the mid-seventeenth-century letters of courtier and diplomat Johan Ekeblad to his brother Claes are systematised. But the thesis is more than a purely logical systematisation of handwriting. Above all, it is a plea for writing as a linguistic system parallel to speech rather than subordinate to it. Writing (and its smallest meaning-bearing unit, the grapheme) is, for Allén, not secondary in relation to speech (and its smallest meaning-bearing unit, the phoneme). Rather, it has undergone an internal development alongside speech. This is the basis of Allén’s graphemic analyses, i.e. his analyses of writing. The thesis brought Sture Allén an assistant professorship and he was soon also appointed acting professor at the Department of Nordic languages (1967–69). In the midst of all this he started a separate research group for modern Swedish. The work of the group was financed by the Bank of Sweden Tercentenary Foundation and the Council for Research in Humanities and the Social Sciences, where in 1972 Allén was appointed Professor of Computational Linguistics. In 1977 the group became an independent department of Göteborg University, Språkdata, the Department of Computational Linguistics. In 1979 Sture Allén was installed as its professor. From 1991 on, Språkdata was part of the Department of Swedish Language. Allén became successively pro-vice-chancellor of Göteborg University for five years and vice-chancellor for one year. The pioneering work by Allén and Språkdata in computational linguistics and lexicography aroused increasing international attention during the 1970s and the great lexical projects started to grow. First out was Nusvensk frekvensordbok (‘Frequency Dictionary of Present-Day Swedish’), in four volumes (1970–80). One million words and phrases from morning newspapers in Stockholm, Göteborg and Malmö were data-processed and systematised with regard to frequency. Early fruits of the same material are the smaller frequency dictionary Tiotusen i topp (1972; ‘Top ten thousand’) and the dictionary of homographs Olika lika ord (1978; ‘Different similar words’). In addition Allén founded the Language Bank in 1975, with a national mission to collect, store, process and provide texts that could be read electronically. This lexical work continued with the Lexical Database project, focusing on definitions of word meanings. In 1986 the project resulted in the major Svensk ordbok (‘A Swedish Dictionary’). The database was further developed from 1990 to be used in the versatile, three-volume Nationalencyklopedins ordbok (1995–96; ‘Dictionary of the Swedish National Encyclopaedia’). Sture Allén was the scientific director of all these projects. Despite his strong orientation towards computers Allén has never lost contact with practical language preservation. In 1974 he joined the Swedish Language Council, producing a spate of articles on language preservation. He always stated very particularly that Språkdata was a humanist institution and nothing else. In the Nordic Language Council’s annual journal Språk i Norden (‘Language in the Nordic countries’) in 1979 he presented an important essay “Om språkvårdens principer” (‘On the principles of language preservation’). In the same year he received the Swedish Academy’s Prize for Language Preservation and the next year he was elected to the Academy. Sture Allén’s work in the Academy has been multi-faceted. He started the publication of a series of Swedish classics and a series of cultural events at the Academy open to the public and introduced data processing in the secretariat and the library. He ensured that Svenska Akademiens ordlista (‘The Swedish Academy Wordlist’) was computerised for its eleventh edition in 1986. That year he also initiated Svenska Akademiens grammatik (‘The Swedish Academy Grammar’) in four volumes (completed in 1999). He is also behind the large OSA (“Om Svar Anhålles” = ‘R.S.V.P.’) project at Språkdata in Göteborg with the result that Svenska Akademiens ordbok (‘The Swedish Academy Dictionary’), continuously in preparation, is now available on the Internet (http://g3.spraakdata.gu.se/saob/). Sture Allén was vice-chairman of the Swedish Language Council for twenty years and since 1984 chairman of the Swedish Society for Belles-Lettres. He has valuable contact surfaces with other fields as a member of, among others, The Royal Swedish Academy of Letters, History and Antiquities, The Royal Swedish Academy of Engineering Sciences, the Norwegian and Finnish academies of science and Academia Europaea; and as an honorary member of the Swedish Literary Society in Finland. To mark Allén’s seventieth birthday in 1999 a monumental selection of his essays over four decades was published, the 730-page Modersmålet i fäderneslandet (‘Our mother-tongue in the land of our fathers’). This helps provide an idea of Sture Allén’s significance for the nurture of the Swedish language during the latter part of the twentieth century. His own interpretation of the formulation in the Swedish Academy’s statutes that enjoins the Academy to “work for the purity, vigour and majesty of the Swedish language” is significant: “We may note that purity here refers mainly to clarity, hardly to purism, that vigour concerns expressiveness and that majesty concerns reputation. For it was necessary to make Swedish into what it is now, a cultural language on a level with other such languages.” (“På ren svenska” [‘In pure Swedish’], in: Språk. Svensklärarföreningens årsskrift [‘Language. Annual of the Association of Teachers of Swedish’], 1986). During the past ten years Sture Allén has returned in large measure to the subject of his earliest research, the seventeenth-century courtier and letter-writer Johan Ekeblad. This occurred in two steps. First Allén published a generous selection of Ekeblad’s letters to his brother, in the Swedish Academy’s classics series, Breven till Claes – om livet och hovet på Kristinas tid (2004) (Letters to Claes – on Life and the Court in the time of Kristina). In this standard-Swedish-orthography selection Ekeblad manages as few others to bring the seventeenth century and Sweden’s remarkable period as a great power to life for today’s reader. It was followed with a more straightforward biography, Johan Ekeblad – Vår man i 1600-talet (2006) (Johan Ekeblad, our Man in the Seventeenth Century). Here Ekeblad emerges full-length; if not as our contemporary, at least as our equal.